High-resolution, wireless and seamless music streaming is the dream of most any homeowner. In today’s broadband driven world of wireless revolutions, many large and small brands have sound systems and single system units that promise that very dream. But if you have any experience with building a sound system or even just investment into a single unit such as a soundbar or standard Bluetooth speaker, you know that not all speakers are created equally. As with any decently sized market, you will find low, mid and high range options. Some offer proven technology while others offer unique integrations with 3rd party services such as music streaming services or home assistants. But few brands, even market leaders, offer options that span the low to high price ranges while maintaining a proven history of technology AND unique integrations with 3rd party services. In fact, only one brand covers that kind of spread. Do you know Sonos? Sonos has become a household name in the 16 years since it was founded in 2002. When most hear “Sonos”, they think of high-caliber, impeccable quality, and with that they often think having the luxurious sound and convenience in their own home comes with a fitting price tag. If you fall into this category, you don’t know Sonos. For instance, the Sonos One is a mere $199, which is a competitive price for a starter speaker that is unparalleled in capabilities. A small sampling of what you get with that $199 price tag is outlined below. Amazon Alexa is built right in. Meaning, you can start and control music with your voice. 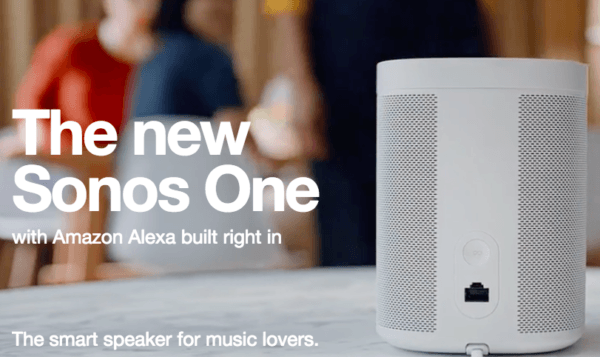 Amazon Music, Spotify, Apple Music, internet radio and 80 other streaming services can be managed via your Sonos One. Easily connect to other Sonos Home Sound Speakers to play your music in any room via a seamless wireless connection that perfectly syncs your audio. Enjoy the top-tier technology of the Sonos brand for a rich sound that fills the room. What we love about the Sonos One is that it is inarguably the best option for anyone looking to dip their toe in the long-term investment of a sound system. The technology allows you to easily add-on additional speakers down the road with easy wireless setups. Since the Sonos One packs enough oomph to fill a room, you can start with a single speaker and down the road, tag on a second speaker to place in another room or add to more in the current room. From there, you may decide you want to go full speaker system monty and add on the Sonos Playbar to create a true surround sound experience. Sonos has much to offer for the speaker novice and expert alike. Whether budget big or small, whether your plan is short-term or long-term, Sonos has a speaker for you. If you don’t know Sonos, don’t worry. We do. And we would be privileged to introduce you.